There’s a new box on the block! It is a whole lot more affordable and all of what we’d expect in terms of quality from Drobo. Bottom Line: The 5C is an affordable, super simple and easy to use, expandable, directly-attached storage device that can hold up to five 3.5″ drives of various brands and capacities for computers that may or may not use USB-C. This magic black box is purposefully featuring a USB-C port for all those who are early adopters, but also features backward compatibility with USB 3.0 over USB-A as well as many other fantastic features found on the popular 5D, specifically referring to hot-swappable drives during failure, as well as expansion, battery backup in case of power failure, a wonderful user interface, and ease of plug and play that simplifies the management of the Drobo. Compared to a traditional RAID box, you’ll save a lot of time and prevent headaches that would cause IT technicians headaches– and most of us aren’t as skilled as a technician, so imagine the migraines that you may save yourself. The best part about this for photographers and videographers, the absolute best thing, is that the capability of expansion. Previously, you’d have to copy the files from one drive to another large drive, or in a traditional RAID box, copy the data off so you can replace the drives. Drobo makes this easy, you remove the smallest sized hard drive and replace it with a larger one! During that whole time you’re still able to access your data and keep working on it. I can’t tell you how many ridiculous hours this alone can save you! For $349, you get the Drobo 5C, power supply, and a USB-C to USB-A cable. If you already have a USB-C ready device, you’ll have to purchase your own USB-C to USB-C cable or use an existing one. Since I’m a crazy tinkerer, I set up the 5C with different drive configurations that may simulate how a photographer on a budget may experience performance. I ended up using two different benchmarking utilities to help you get an idea of the speed of the data-saving storage box. I did it in these specific groups for all you who are out there who can’t think of just dropping $900 on a full set of five 4TB drives– like me. The joy of the Drobo is that you can build the storage as you need to. With that in mind for you, I started with two affordable, standard issue, 1TB 7200RPM drives from Seagate. If you have a little bit more money to spend on storage initially, I’d recommend jumping to a NAS drive for reliability, or a gaming/performance hard drive for speed. I tested it with the two 3TB Western Digital RED drives that I chose specifically for longevity instead of performance– after all, this drive is to help you keep your data with the long term in mind. Finally, I combined all the drives and added another 1TB drive I had removed from an old external hard drive enclosure, which turned out to be another Seagate. I’m sure that many of you have accumulated quite a few external hard drives over the years. Adding them into a Drobo is a great way to repurpose those drives. I wanted to provide an idea of base performance that one would expect from a setup with one of the slowest possible USB-C laptops. So, for the sake of this benchmark, I disabled Turbo Boost on this Mac, allowing it to only run at a steady 1.3GHz, and connected the Drobo 5C to the MacBook via a USB-C 3.1 cable from Anker that I got off Amazon for $15. Other USB-C cables may only be USB 2.0, so be aware when you purchase one. If you install one of those in for the Drobo or have a processor that’s faster than what I’m using, I’m sure you’ll get a pretty good performance jump. I tend to do a lot of synthetic benchmarking with two different programs that have been used over the years. Blackmagic Design’s Disk Speed Test, and another one called Quick Bench. In case people were are wondering about settings, I used a 5GB stress test to see the max bandwidth we can get from the device. in Quick Bench, I chose an extended test that reads and writes files in different file size increments, from 20MB to 100MB, and then had the software repeat itself 10 times to get an average for the final results. I started off with the basics, two everyday Seagate drives. These are just standard drives that everyone can pick up for roughly $47 each or so at B&H. These are just great starter drives, so I figured I’d test them out as an example of a starting point for people out there. These made-for-NAS drives are drives that are meant to be running for a long time. They’re not technically the fastest performing drives but they provide a good amount of performance and durabiity over the long run, while saving some power and running quietly and efficiently. Over time, you’ll eventually fill up the Drobo 5C slots with hard drives that you’ll need. With mismatched drives, I wanted to see how the performance would be affected. To me, the performance of this Drobo isn’t surprising to me, as my Drobo 5D also performed similarly as I started off with it. It’s been a great simple box to play with. I’d expect it to work as well as my 5D as time goes on. Drobo recommends that for the best performance, have all 5 drives in. The benchmarks clearly show a drastic improvement in write speeds with all 5 drives in compared to just 2. There’s are differences between the two brands of drives that were running. In a real world scenario, I personally doubt that anyone would really see a difference in transfer times between these two brands drives. They aren’t specialized performance drives, but at least you can expect at least this much speed out of it– which is more than enough for offloading and holding your images in Lightroom like I do. The Drobo 5C, with a nice budget entry level price of $349, does miss out on one feature that I enjoy from the 5D, which is the mSATA accelerator card–used as hot cache for all the transfers back and forth. The 5D can be had for $599, which has both two Thunderbolt ports and USB 3.0 connectivity as well. It seems much lower price of entry for Drobo compared to their past products. But the other issue was lower performance compared to other products. Good to hear they start with a more competitive price but with Apple pushing USB-C more, there should be more competition coming into this space. 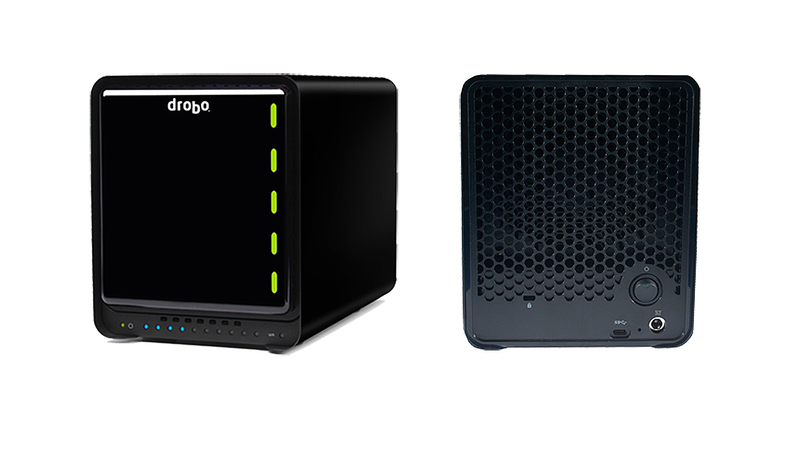 Considering you can load a Drobo 5C up with five 8TB drives for 40TB of raw capacity, and you can set it up to have dual drive redundancy, its combination of storage, speed, reliability and price is hard to beat. Many faster devices uses RAID 0 to maximize speed, at the cost of redundancy and a limit on storage. Some of those other products would be great if you are looking for a lot of raw, fast external storage to work on, but not for long term storage. It may be faster and cheaper than the Drobo, but lacks the aggregate storage capacity and the multiple levels of data protection, combined with the ability to swap out failed drives on the fly. About performance and price, the G-Technology G-SPEED Q, another Direct Attached Storage device that I’ve found to be a good competitor, showed very similar performance to what I posted above in their 8TB form. That device, outfitted with 4x2TB 7200RPM Hitachi drives, retails for $999.95 on their website. You can buy 5x2TB Hitachi 7200RPM drives for $300 add them to the Drobo 5C and still make out with cash in your pocket as well as more storage for your data. And of course, Drobo devices are easily expandable without weird restrictions– as long as the size of the drive that you’re replacing is the same or larger, things will work. Others require that you replace a failed drive with the largest capacity drive that is in the array. Actually, you can load it up with five 8 TB drives for 32 TB capacity, or five 10 TB drives for 40 TB capacity. Use dual parity volumes and you’re down to 24 TB and 30 TB respectively. I apologize that I stated raw capacity, which in my mind would be the simplistic (8TBx5).. but of course, you and I both know that the numbers can be misleading, since at the gigabyte level, you lose roughly 7.2% due to the consumer confusion of 1KB and 1KiB, and 1GB and 1GiB and all the good binary and decimal confusion. So actually, based of of Drobo’s Capacity Calculator (which does a general calculation for the GiB mismatch), you can load it up with five 8TB drives for 29.05TB of space after 7.32TB is used for protection, or five 10TB drives for 36.31TB with 9.15TB used for protection. Dual disk redundancy changes it to 21.78TB and 27.23TB respectively. I believe the 5D just has Thunderbolt ports, not Thunderbolt 2 as is stated at the end of this article, no? Only the 5Dt has Thunderbolt 2. Drobo’s current specs for the 5D list Thunderbolt 2. The only differences between the 5D and 5Dt are the included mSATA SSD, the included Thunderbolt 2 cable, and the year of DroboCare all included with the 5Dt. Otherwise, per drobocom, they have identical specs. Either Drobo is falsely advertising the 5D, or they did a silent update, or they mislabeled the capability as slower Thunderbolt instead of Thunderbolt 2 on release and somehow no one noticed (and they never replied to all the complaints about it not being TB2 out of the gate). My money is on a silent update, but I’m not sure when it would have happened.